The methods available for determination of environmental contamination by plutonium at ultra-trace levels require labor-consuming sample preparation including matrix removal and plutonium extraction in both nuclear spectroscopy and mass spectrometry. 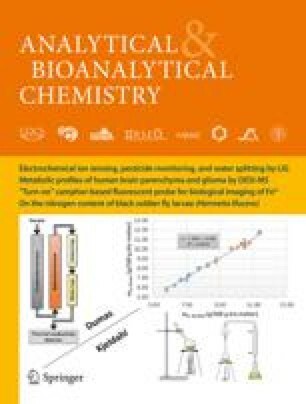 In this work, laser-ablation inductively coupled plasma mass spectrometry (LA–ICP–MS) was applied for direct analysis of Pu in soil and sediment samples. Application of a LINA-Spark-Atomizer system (a modified laser ablation system providing high ablation rates) coupled with a sector-field ICP–MS resulted in detection limits as low as 3×10−13 g g−1 for Pu isotopes in soil samples containing uranium at a concentration of a few μg g−1. The isotope dilution (ID) technique was used for quantification, which compensated for matrix effects in LA–ICP–MS. Interferences by UH+ and PbO2 + ions and by the peak tail of 238U+ ions were reduced or separated by use of dry plasma conditions and a mass resolution of 4000, respectively. No other effects affecting measurement accuracy, except sample inhomogeneity, were revealed. Comparison of results obtained for three contaminated soil samples by use of α-spectrometry, ICP–MS with sample decomposition, and LA–ICP–IDMS showed, in general, satisfactory agreement of the different methods. The specific activity of 239+240Pu (9.8±3.0 mBq g−1) calculated from LA–ICP–IDMS analysis of SRM NIST 4357 coincided well with the certified value of 10.4±0.2 mBq g−1. However, the precision of LA–ICP–MS for determination of plutonium in inhomogeneous samples, i.e. if "hot" particles are present, is limited. As far as we are aware this paper reports the lowest detection limits and element concentrations yet measured in direct LA–ICP–MS analysis of environmental samples. Sergei F. Boulyga is on leave from The Radiation Physics and Chemistry Problems Institute, 220109 Sosny, Minsk, Belarus. The authors would like to thank the "Stiftung Innovation Rheinland-Pfalz" for financial support.